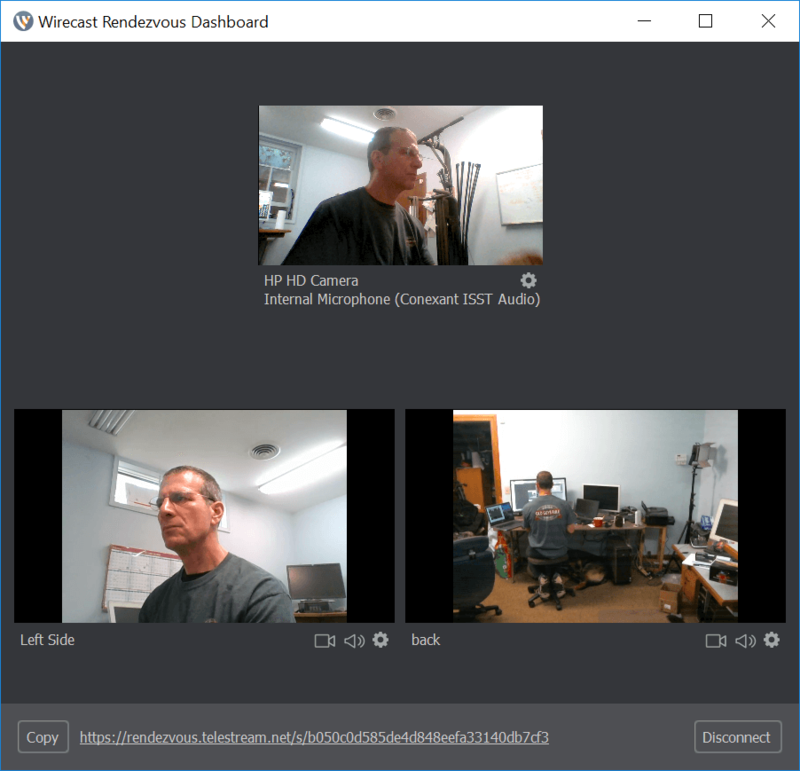 In Wirecast, you input your remote guests as separate inputs, just like a camera or webcam. Here’s the procedure for doing so. First I’ll show the host side, then the guest side. 1. Create the Rendezvous session (Figure 1, below). 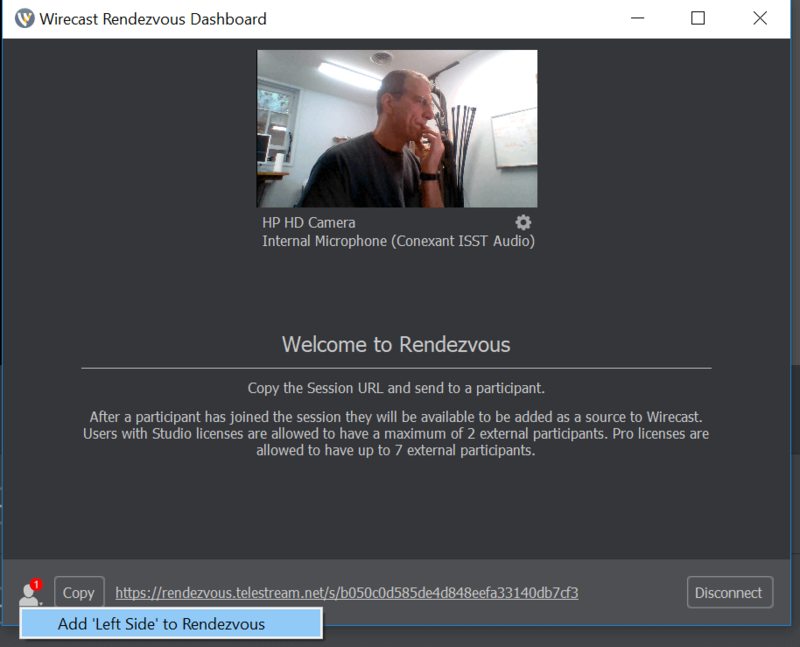 Click the plus sign on any layer and choose Rendezvous Session > Create Rendezvous Session. 2. Invite your guests. 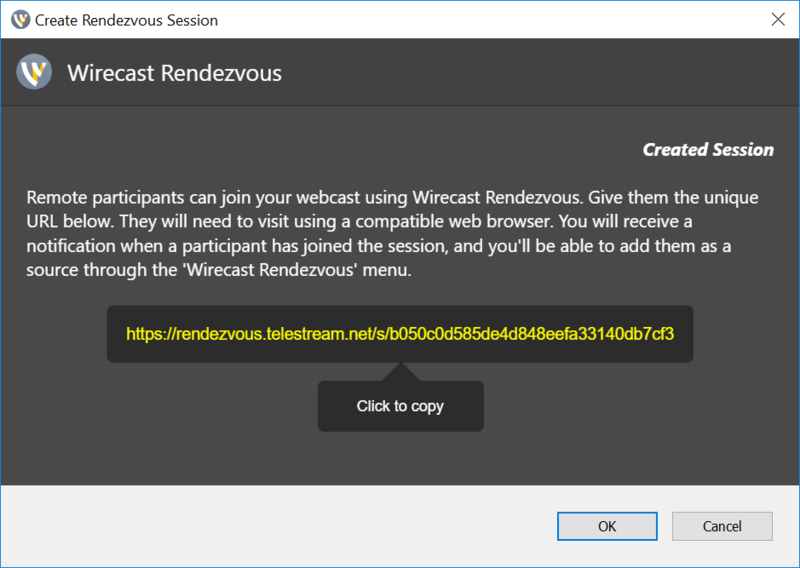 Wirecast opens the Create Rendezvous Session dialog with a URL to send to your guests (Figure 2, below). Copy the link, send it to your guests, and click OK.
3. Choose what your guests see and hear. 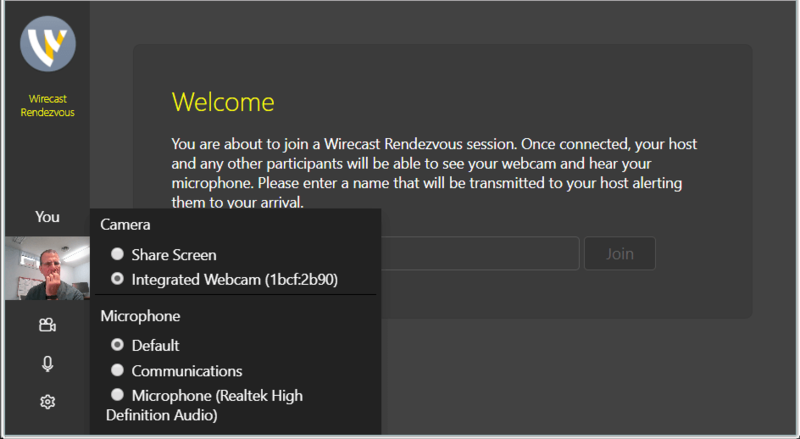 Wirecast opens the Rendezvous Dashboard shown in Figure 3 (below). Click the gear to the right of the video window and choose the video and audio feed to send to the guests. This is what they will see and hear from the host during your conversation. Note that you’ll use the Rendezvous Dashboard to add and control users to the program. 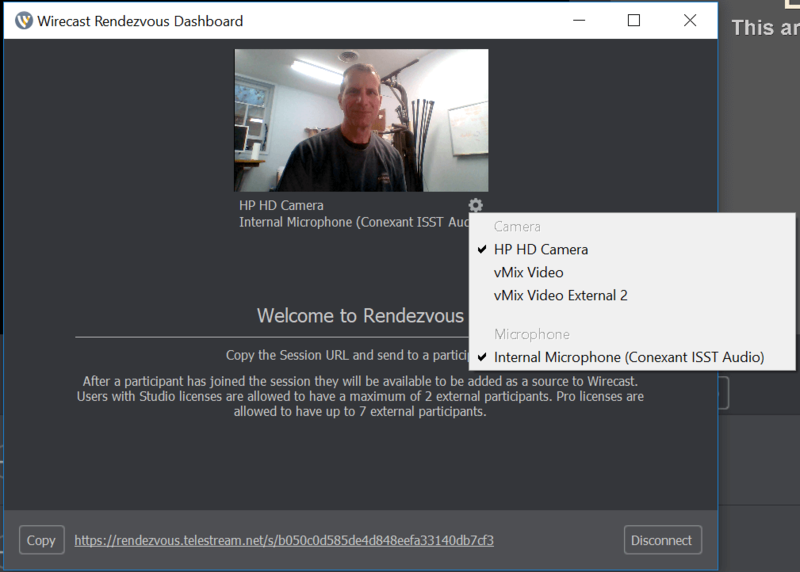 You can close it without disconnecting the session, and if you need it again, you can reopen it by choosing Window > Open Rendezvous Dashboard. 4. 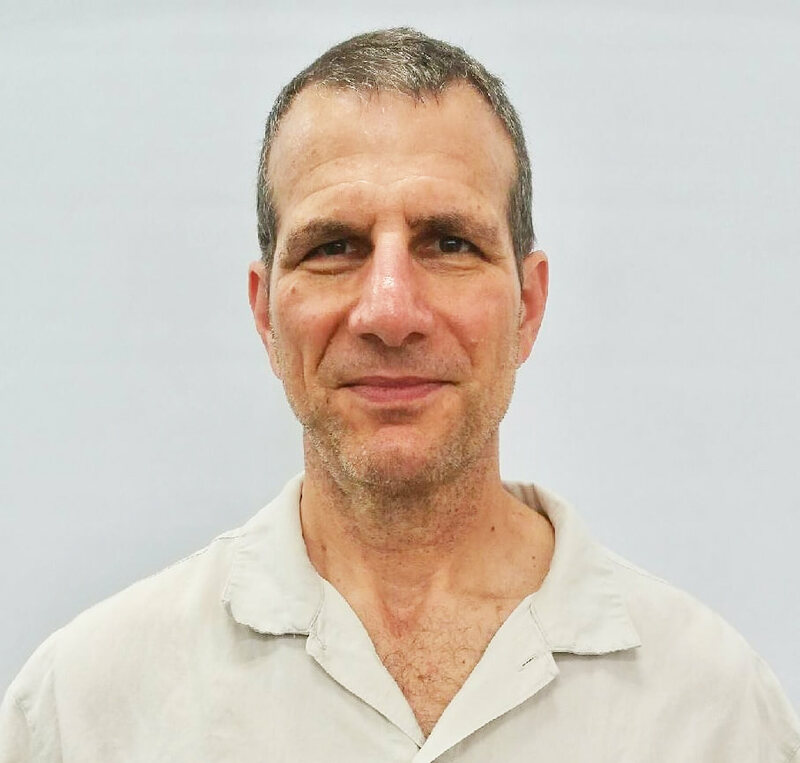 Add guests. As guests respond to your invitation, Wirecast will show them on the bottom left of the Rendezvous Dashboard. I named this guest Left Side due to the positioning of the webcam (Figure 4, below). 5. Control your guests. As your guests enter the Rendezvous, each will appear on the bottom of the Dashboard (Figure 5, below). Beneath each guest, you can use the Gear to disconnect, mute audio by clicking the speaker icon, and stop the video by clicking the camera icon. At this point, your guests are inputs you can insert into a shot. Let’s cover what this all looks like from the guests’ perspective, then we’ll circle back and create the shot. If you’re a guest, your operation will start when you receive a link from the host. At this point, it’s best if you copy the link into a current version of Chrome or Firefox which offer the best WebRTC support. We used Chrome for all tests. 1. Load URL into Firefox or Chrome. 2. 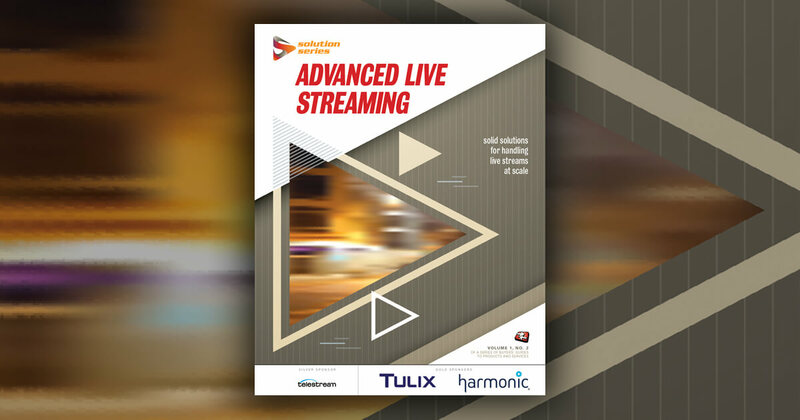 Configure your video and audio sources. Click the gear icon to open the settings screen shown in Figure 6 (below) and choose your sources. Note that you can share your screen or use a video source. Figure 6. This is the first screen you’ll see as guest. 3. Type your name into the name field and press Join. The name field is hidden behind the setting screen in Figure 6, but you can see the box and the Join button which will become active once you enter in your name. 4. You’re in. Be informative and engaging. Figure 7 (below) shows what you’ll see as a guest; the host and other guests. 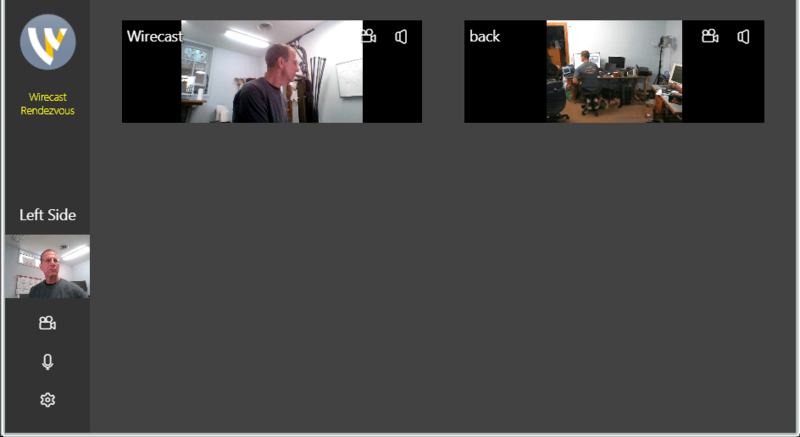 Note the speaker and camera icons you can use to mute the audio and shut off the video for each participant. Figure 7. What each guest sees during each conference.